Heinrich Bernhardt was born in Norka, Russia on August 14, 1876. Heinrich immigrated to the United States in ? and settled in Portland. Magdalena was born in Norka on July 12, 1878, the daughter of Heinrich Schleicher (born 1850) and Elisabeth Krieger (born 1852). They Schleicher family departed Norka for the United State on October 23, 1886. On April 28, 1897, Heinrich (Henry) married Magdalena (Lena) in Portland, Oregon. They had three children: Roy, Helen and Henry. In 1905, the family was living at 560 Failing Street (now 1016 NE Failing) and Henry was working as a baker. From left to right: Roy B. Bernhardt, Henry Bernhardt, Lena Schleicher Bernhardt and Helen Bernhardt. 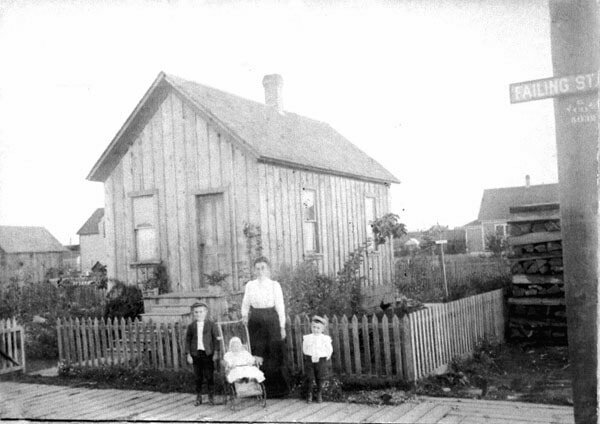 Written on back of photograph: "This little home was built by Henry Bernhardt perhaps about 1904. They kept a cow and sold a few quarts of milk. I went there every day to get our 2 quarts. In the picture are: Your mother, Roy, Henry, & Helen. I believe the house consisted of 2 little rooms. The toilet was on rear of lot. (signed by) Lydia Glomstad"
It appears that Lena and Henry separated and she went live with her father in Midvale, Idaho. Lena died in Midvale on March 10, 1911 and her father passed there in 1919. Virginia McKay (née Reed), granddaughter of Heinrich and Magdalena Schleicher.